On Friday, September 19th, we held a workshop — or, more accurately, a gameshop — on the future of work. 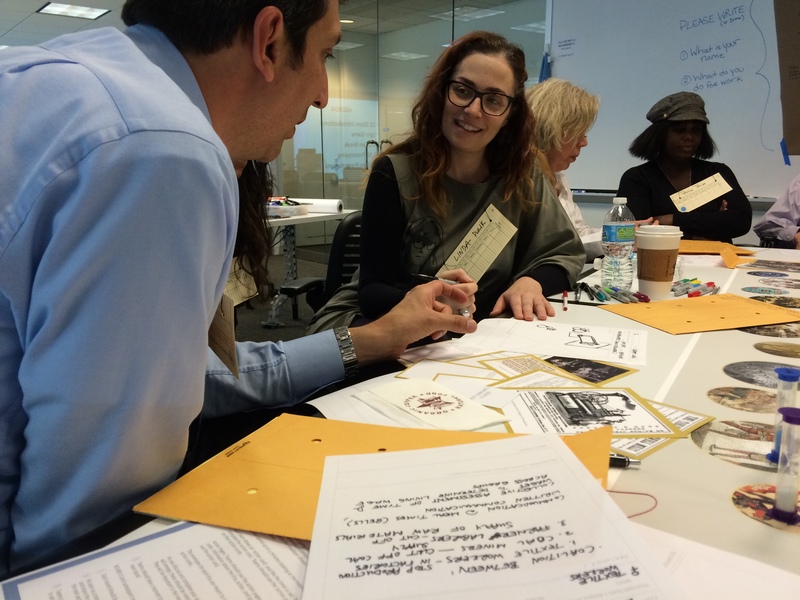 Approximately 30 people, including labor organizers and advocates, foundation administrators, scholars, technology experts, and designers, gathered at the Chicago Institute for Design for the event, which was part of a three month project on the future of work supported by the Open Society Foundations. We played with the ways technology and labor are intertwined throughout history, and imagined new scenarios in the past, present, and future in the hopes of using factual and counterfactual histories to think in new ways about the future. The day was structured in two parts. First, we drew inspiration from cultural probes, reflective design, meaningful play, and critical games to create a board game in which participants created imagined interventions into labor history. 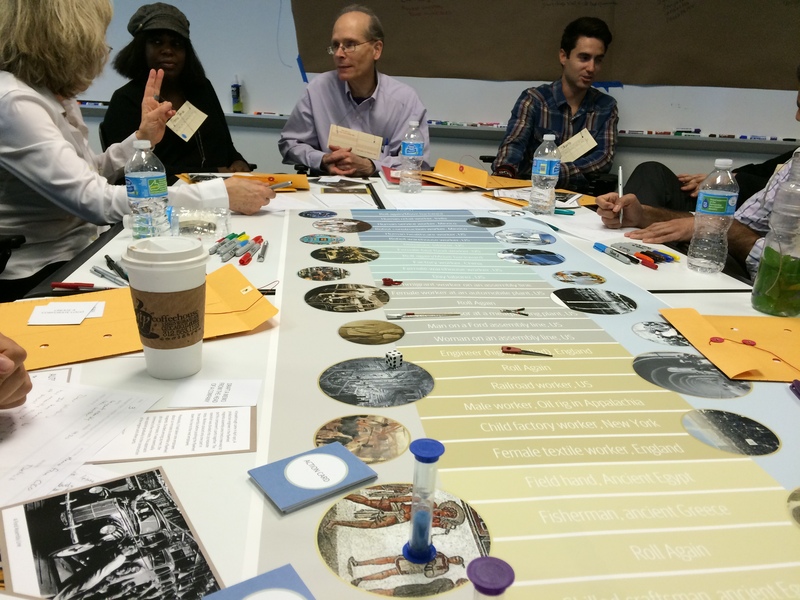 Players traveled across a game board that took the form of a timeline to engage with historical technologies throughout several eras. In ancient Greece, for example, they were presented with information about devices for measuring time such as the water clock; in the late industrial era, they examined the assembly line; in the present, they focused on technologies associated with the automated warehouse; and in the future, they played with ideas surrounding robots and artificial intelligence. Each turn, teams moved through time and were tasked with creative actions like “design a corporate logo” and “plan a collective action” within the designated time period and technology. Their particular space on the board provided them with a perspective from which to approach the task. They might, for instance, land on “child factory worker, England” in the era of the steam engine. Teams gathered around a game board in the shape of a timeline that spanned almost 3000 years. The board was divided into 5 eras, and each era explored labor in terms of set of technologies. Teams drew inspiration from quotes, images, and information cards in each era, but their task (action card) asked them to create something new, and allowed them to depart from the historical timeline. 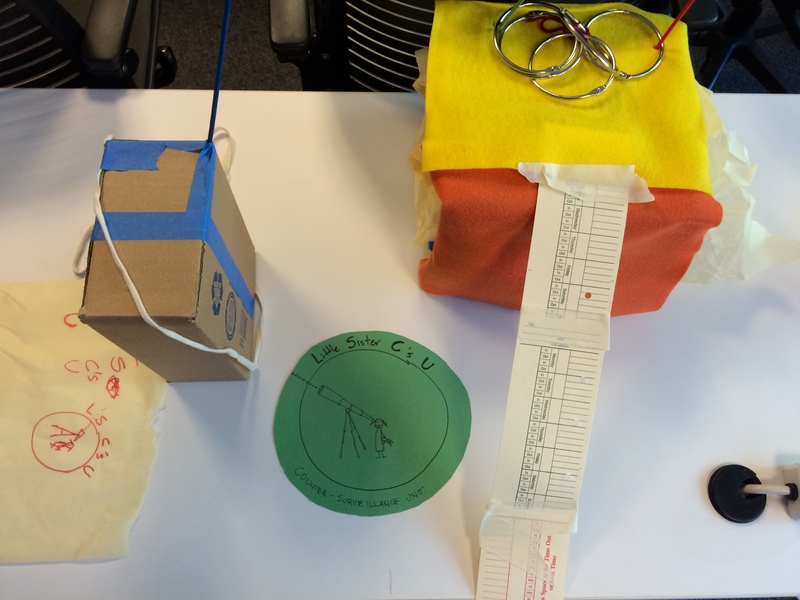 In the second part of the workshop, teams used lo-fidelity prototyping (with materials such as string, cardboard boxes, metal mesh, felt and blue tape) to build on some of the ideas that were proposed during the game play. We asked groups to think about the most counterintuitive revelations during the game, and to build on those by creating an object, prototype, platform or experiment of some kind. We had two aims in mind when we began this project. The first was to explore the ways design methods like prototyping could be used to help labor advocates create new alliances and different approaches to the opportunities and challenges they face in day-to-day organizing around the future work. The second was to use the past to examine the future. Both of these goals focused on helping labor advocates plan for the future, but early interviews with labor organizers and activists were revealing. For example, the challenges that labor advocates face are more immediate; for them, working for more equitable labor policies means planning through the next election cycle, not the next century. Additionally, continued struggles for living wages and other rights means that engaging with the ways new technologies are reconfiguring (and sometimes eliminating) labor is more abstract. These interviews informed our game design, and ultimately, we are hopeful that our reimagining work game helped open the door to longer term thinking and planning as well as new possibilities for partnerships between technologists, designers, labor advocates and workers. This project is supported by the Open Society Foundations’ U.S. Programs Future of Work inquiry, which is bringing together a cross-disciplinary and diverse group of thinkers to address some of the biggest questions about how work is transforming and what working will look like 20-30 years from now. The inquiry will explore how the transformation of work, jobs and income will affect the most vulnerable communities, and what can be done to alter the course of events for the better.